This article is about the region in Europe. For other uses, see Ardennes (disambiguation). "Forest of Ardennes" redirects here. It is not to be confused with Forest of Arden. The Ardennes (/ɑːrˈdɛn/; French: L'Ardenne; Dutch: Ardennen; Walloon: L'Årdene; Luxembourgish: Ardennen; also known as the Ardennes Forest or Forest of Ardennes) is a region of extensive forests, rough terrain, rolling hills and ridges formed by the geological features of the Ardennes mountain range and the Moselle and Meuse River basins. Geologically, the range is a western extension of the Eifel, and both were raised during the Givetian age of the Devonian (387.7 to 382.7 million years ago) as were several other named ranges of the same greater range. Located primarily in Belgium and Luxembourg, but stretching as well into Germany and France (lending its name to the Ardennes department and the former Champagne-Ardenne region), and geologically into the Eifel—the eastern extension of the Ardennes Forest into Bitburg-Prüm, Germany, most of the Ardennes proper consists of southeastern Wallonia, the southern and more rural part of the Kingdom of Belgium (away from the coastal plain but encompassing over half of the kingdom's total area). The eastern part of the Ardennes forms the northernmost third of the Grand Duchy of Luxembourg, also called "Oesling" (Luxembourgish: Éislek), and on the southeast the Eifel region continues into the German state of the Rhineland-Palatinate. The trees and rivers of the Ardennes provided the charcoal industry assets that enabled the great industrial period of Wallonia in the 18th and 19th centuries, when it was arguably the second great industrial region of the world, after England. The greater region maintained an industrial eminence into the 20th century, after coal replaced charcoal in metallurgy. Allied generals in World War II felt the region was impenetrable to massed vehicular traffic and especially armor, so the area was effectively "all but undefended" during the war, leading to the German Army's twice using the region as an invasion route into Northern France and Southern Belgium, via Luxembourg in the Battle of France and the later Battle of the Bulge. The Eifel range in Germany adjoins the Ardennes and is part of the same geological formation, although they are conventionally regarded as being two distinct areas. Croix-Scaille 504 m (1,654 ft), hosting the Tour du Millénaire, Province of Namur, in Belgium on the border to France. N.B. the Belgian Province of Luxembourg in the above list is not to be confused with the country known as the Grand Duchy of Luxembourg. The Ardennes is an old mountain range formed during the Hercynian orogeny; in France similar formations are the Armorican Massif, the Massif Central, and the Vosges. The low interior of such old mountains often contains coal, plus iron, zinc and other metals in the sub-soil. This geologic fact explains the greatest part of the geography of Wallonia and its history. In the North and West of the Ardennes lie the valleys of the Sambre and Meuse rivers, forming an arc (Sillon industriel) going across the most industrial provinces of Wallonia, for example Hainaut, along the river Haine (the etymology of Hainaut); the Borinage, the Centre and Charleroi along the river Sambre; Liège along the river Meuse. The region was uplifted by a mantle plume during the last few hundred thousand years, as measured from the present elevation of old river terraces. This geological region is important in the history of Wallonia because this old mountain is at the origin of the economy, the history, and the geography of Wallonia. "Wallonia presents a wide range of rocks of various ages. Some geological stages internationally recognized were defined from rock sites located in Wallonia: e.g. Frasnian (Frasnes-lez-Couvin), Famennian (Famenne), Tournaisian (Tournai), Visean (Visé), Dinantian (Dinant) and Namurian (Namur)". Except for the Tournaisian, all these rocks are within the Ardennes geological area. The Ardennes includes the greatest part of the Belgian province of Luxembourg (number 4; not to confound with the neighbouring Grand Duchy of Luxembourg), the south of the province of Namur (number 5) and the province of Liège (number 3) plus a very small part of the province of Hainaut (number 2), as well as the northernmost third of the Grand Duchy of Luxembourg, called Oesling (Luxembourgish: Éislek) and the main part of the French department called Ardennes. Before the 19th century industrialization, the first furnaces in the four Walloon provinces and in the French Ardennes used charcoal for fuel, made from harvesting the Ardennes forest. This industry was also in the extreme south of the present-day Belgian province of Luxembourg (which until 1839 was part of the Grand Duchy of Luxembourg), in the region called Gaume. The most important part of the Walloon steel industry, using coal, was built around the coal mines, mainly in the region around the cities of Liège, Charleroi, La Louvière, the Borinage, and further in the Walloon Brabant (in Tubize). Wallonia became the second industrial power area of the world (after Great Britain) in proportion to its territory and to its population (see further). The rugged terrain of the Ardennes limits the scope for agriculture; arable and dairy farming in cleared areas form the mainstay of the agricultural economy. The region is rich in timber and minerals, and Liège and Namur are both major industrial centres. The extensive forests have an abundant population of wild game. The scenic beauty of the region and its wide variety of outdoor activities, including hunting, cycling, walking and canoeing, make it a popular tourist destination. The region takes its name from the vast ancient forest known as Arduenna Silva in the Roman Period. Arduenna probably derives from a Gaulish cognate of the Brythonic word ardu- as in the Welsh: ardd ("high") and the Latin arduus ("high", "steep"). The second element is less certain, but may be related to the Celtic element *windo- as in the Welsh wyn/wen ("fair", "blessed"), which tentatively suggests an original meaning of "The forest of blessed/fair heights". The Ardennes likely shares this derivation with the numerous Arden place names in Britain, including the Forest of Arden. Rock Bayard of Dinant, on the right bank of the Meuse River. According to a legend, a magic horse jumped from the top of this rock to the left bank of the river, carrying the Quatre Fils Aymon fleeing Charlemagne. The modern Ardennes region covers a greatly diminished area from the forest recorded in Roman times. 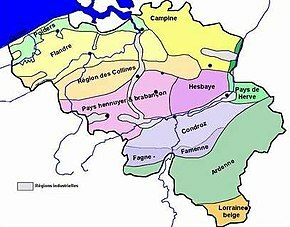 Another song about Charlemagne, the Old French 12th-century chanson de geste Quatre Fils Aymon, mentions many of Wallonia's rivers, villages and other places. In Dinant the rock named Bayard takes its name for Bayard, the magic bay horse which, according to legend, jumped from the top of the rock to the other bank of the Meuse. On their pillaging raids in the years 881 and 882, the Vikings used the old Roman roads in the Ardennes and attacked the abbeys of Malmedy and Stablo and destroyed Prüm Abbey in the Eifel. The strategic position of the Ardennes has made it a battleground for European powers for centuries. Much of the Ardennes formed part of the Duchy (since 1815 the Grand Duchy) of Luxembourg, a member state of the Holy Roman Empire, which changed hands numerous times between the powerful dynasties of Europe. In 1793 revolutionary France annexed the whole area, together with all other territories west of the Rhine river. In 1815 the Congress of Vienna, which dealt with the political aftermath of the Napoleonic Wars, restored the previous geographical situation, with most of the Ardennes becoming part of the Grand Duchy of Luxembourg. After the revolution of 1830 which resulted in the establishment of the Kingdom of Belgium, the political future of the Ardennes became a matter of much dispute between Belgium, Luxembourg and the Netherlands, as well as involving the contemporary great powers of France, Prussia and Great Britain. As a result, in 1839 the Grand Duchy of Luxembourg ceded the westernmost 63% of its territory (being also the main part of the Ardennes) to the new Kingdom of Belgium, which renamed the area Province of Luxembourg. In the 20th century the Ardennes was widely thought by leading military strategists to be unsuitable for large-scale military operations, due to its difficult terrain and narrow lines of communications. However, in both World War I and World War II, Germany successfully gambled on making a rapid passage through the Ardennes to attack a relatively lightly defended part of France. The Ardennes became the site of three major battles during the world wars—the Battle of the Ardennes (August 1914) in World War I, and the Battle of France (1940) and the Battle of the Bulge (1944–1945) in World War II. Many of the towns of the region suffered severe damage during the two world wars. The Battles of the Frontiers (1914) involved a series of collisions between the French and the German armies. 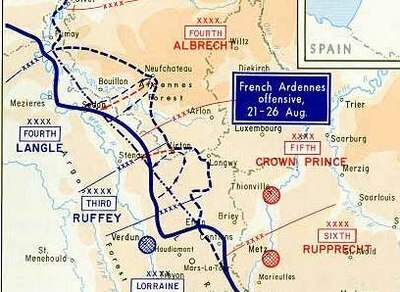 The French forces carried out a counteroffensive ("Plan XVII"), attacking the flank of the westwards-advancing German army executing its Schlieffen Plan. The Battle of the Ardennes (1914) was the second of the Battles of the Frontiers, After the advancing German left wing defeated French forces in Lorraine, France launched another attack just north of Lorraine, advancing temporarily into the Ardennes. The military strategists of Nazi Germany in 1939 and 1940 selected the forest as the primary route of their mechanized forces in the Invasion of France. The forest's great size could conceal the armoured divisions, and because the French did not suspect that the Germans would make such a risky move, they did not consider a breakthrough there, or considered that it would take at least 15 days for an army to pass through the forest. German forces, primarily under the command of Erich von Manstein, carried out the plan in two days, and managed to slip numerous divisions past the Maginot Line to attack France and rout the French forces. In May 1940 the German army crossed the Meuse, despite the resistance of the French army. Under the command of General Heinz Guderian, the German armoured divisions crossed the river at Dinant and at Sedan, France. This was a crucial step in the push towards Paris, and France fell on June 25, 1940. The Ardennes area came to prominence again during the Battle of the Bulge. The German Army launched a surprise attack in December 1944 in an attempt to capture Antwerp and to drive a wedge between the British and American forces in northern France. Allied forces blocked the German advance on the river Meuse at Dinant. Local residents say that a German vehicle exploded just before the Bayard rock, possibly after triggering a mine laid by US soldiers. They said the incident followed the legend of protection by the rock and its horse. Dinant's Rock was perhaps[original research?] the most advanced position of the German army during this battle. Battle of France (1940) The Germans execute Erich Von Manstein's plan for Fall Gelb. Armoured divisions cross the Meuse (16 May), (principally in Dinant) and Sedan and the Ardennes. The Ardennes is just at the east of the red shading which marks the extent of the German advance. On 16 May General Maurice Gamelin said he could no longer protect Paris because he had lost the Ardennes. 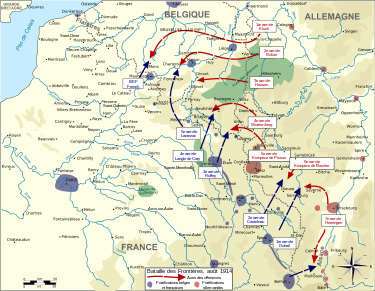 Battle of France (1940) The Wehrmacht advances further, particularly accelerating through the Gembloux gap northwest of the Ardennes, in the week of 21 May (red shading), quickly reaching Abbeville, near the English Channel. This cut off the Allied troops of the North (some French divisions, the Belgian Army and the British Expeditionary Force). With this, the German armies won the first stage of the Battle of France. Battle of the Bulge. In 1944, the Germans counterattacked across the Ardennes and the Meuse valley but they were eventually thwarted after fierce battles. Their most advanced position was the "nose" of the salient, just in front of Dinant and the Meuse river. They had wanted to move northeast and reach Antwerp and the North Sea. The salient was mainly in the Ardennes, its "nose" being just to the west of it, in the Condroz. Areas above 400 metres (1,300 ft) (shown in the darkest shade of brown) form the heart of the Ardennes. Wikivoyage has a travel guide for Ardennes. 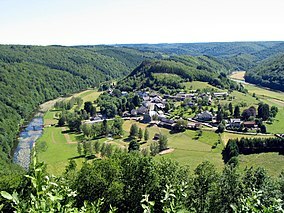 Wikimedia Commons has media related to Ardennes. ^ The defining stratotype for the geological period is an outcropping in Givet in the Ardennes. ^ "Most beautiful rocks of Wallonia"
^ Vasmer, Max (1986–1987) [1950–1958]. "рост". In Trubachyov, O. N.; Larin, B. O. (eds.). Этимологический словарь русского языка [Russisches etymologisches Wörterbuch] (in Russian) (2nd ed.). Moscow: Progress. ^ Regino von Prüm, Chronik, ad a. 882. ^ Frieser, Karl (2005). The Blitzkrieg Legend. Annapolis, MD: Naval Institute Press. pp. 100–197. The Meuse or Maas is a major European river, rising in France and flowing through Belgium and the Netherlands before draining into the North Sea from the Rhine–Meuse–Scheldt delta. It has a total length of 925 km. Walloons are a Romance ethnic group native to Belgium, principally its southern region of Wallonia, who speak French and Walloon. Walloons are a distinctive ethnic community within Belgium. Important historical and anthropological criteria bind Walloons to the French people. Belgium is a federal state located in Western Europe, bordering the North Sea. Belgium shares borders with France (556 km), Germany (133 km), Luxembourg (130 km) and the Netherlands (478 km). Belgium comprises the regions of Flanders, Wallonia and Brussels. Luxembourg, also called Belgian Luxembourg, is the southernmost province of Wallonia and of Belgium. It borders on the country of Luxembourg, France, and the Belgian provinces of Namur and Liège. Its capital is Arlon, in the south-east of the province. Wallonia is a region of Belgium. 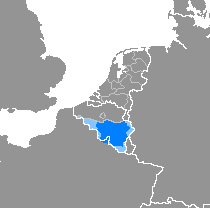 As the southern portion of the country, Wallonia is primarily French-speaking, and accounts for 55% of Belgium's territory and a third of its population. The Walloon Region was not merged with the French Community of Belgium, which is the political entity responsible for matters related mainly to culture and education, because the French Community of Belgium encompasses both Wallonia and the majority French-Speaking Brussels-Capital Region. Liège is the easternmost province of Wallonia and Belgium. The country of Belgium is divided into three regions. Two of these regions, the Flemish Region or Flanders, and Walloon Region, or Wallonia, are each subdivided into five provinces. The third region, the Brussels-Capital Region, is not divided into provinces, as it was originally only a small part of a province itself. Dinant is a Walloon city and municipality located on the River Meuse, in the Belgian province of Namur. It is around 90 kilometres (56 mi) south-east of Brussels, 30 kilometres (19 mi) south-east of Charleroi, 30 kilometres (19 mi) south of Namur and 20 kilometres (12 mi) north of Givet (France). Namur is a city and municipality in Wallonia, Belgium. It is both the capital of the province of Namur and of Wallonia, hosting the Parliament of Wallonia, Walloon Government and administration. Walloon is a Romance language that is spoken in much of Wallonia in Belgium, in some villages of Northern France and in the northeast part of Wisconsin until the mid 20th century and in some parts of Canada. It belongs to the langue d'oïl language family, whose most prominent member is the French language. The historical background of its formation was the territorial extension since 980 of the Principality of Liège to the south and west. Namur was a county of the Carolingian and later Holy Roman Empire in the Low Countries. Its territories largely correspond with the present-day Belgian arrondissement Namur plus the northwestern part of the arrondissement Dinant, both part of the modern province of Namur, and previously part of the French Republican department of Sambre-et-Meuse. The Ourthe is a 165-kilometre (103 mi) long river in the Ardennes in Wallonia (Belgium). It is a right tributary to the river Meuse. The Ourthe is formed at the confluence of the Ourthe Occidentale and the Ourthe Orientale, west of Houffalize. Sambre-et-Meuse was a department of the First French Empire in present-day Belgium. It was named after the rivers Sambre and Meuse. Its capital was Namur. The Talleyrand partition plan for Belgium was a proposal developed in 1830 at the London Conference of 1830 by the French ambassador to Britain Charles Maurice de Talleyrand, to partition Belgium. The proposal was part of the intensive negotiations among five great powers over the future of Belgium after the success of the Belgian revolution for independence. The Citadel of Dinant is a fortress located in the Walloon city of Dinant in the province of Namur, Belgium. The current fort was built in 1815 on a site which was originally fortified in 1051 when the region was ruled by the Prince-Bishopric of Liège. The citadel overlooks the city of Dinant and the strategic Meuse river which runs through the town. It is open to the public. The Baraque de Fraiture is the highest point in the Province of Luxembourg, Belgium. Situated in the Municipality of Vielsalm, it is 652 metres (2,139 ft) high. It has a ski area comprising 3 pistes, which open for less than 20 days a year. However, it has been open for up to 60 days per year recently. Ardennes and Eifel are mountain ranges in Europe that form part of the same volcanic field and also of the Rhenish Massif. These are mountains and hills composed of slate and limestone, and of an average altitude of 400 to 500 meters, with several summits reaching the 700 meters. The pointe de Givet is the extreme north of the department of Ardennes in the Grand Est region in northeastern France. This small territory is 25 km in length and 10 km wide and forms a small strip extending deep into Belgian Ardennes along the Meuse. Larger cities in the pointe de Givet include Revin, Fumay, and Givet.